At D J Thomas & Son Funeral Directors in Bargoed, we are dedicated to giving you an unrivalled standard of funeral care. Our funeral home was founded in 1908, and we have been honouring the wishes of families in our community ever since. You will receive compassion and support every step of the way. We will help you with all the decisions and ensure the funeral service is unique and a true reflection of the way your loved one lived their life. Since we opened our doors over a century ago, we have organised funerals of all types. So no matter what your preference is, your loved one will get a respectful and dignified send off. For your convenience, we have a service chapel, which can hold up to 120 family and friends. In the chapel, we have a built in sound system and an organ which you can use. We will cater to whatever you think will make a fitting goodbye. As your local funeral directors, we serve the neighbouring towns and villages of Aberbargoed, Penpedairheol, Pengam, Markham and Brithdir. 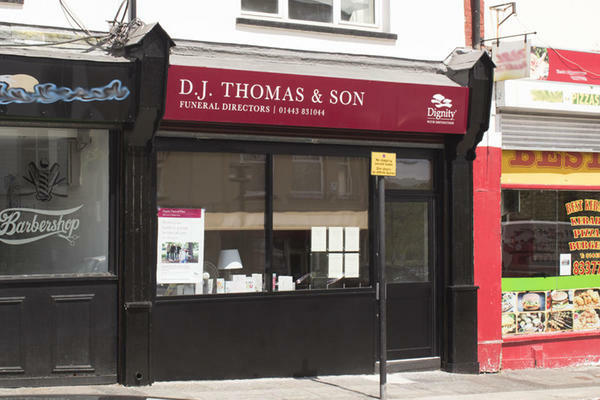 We also have two other D J Thomas Funeral Directors in Caerphilly and Ystrad Mynach. Our lines are open 24 hours a day, so call us at any time. We are here to give you advice or answer any questions you have. Call us today on 01443 831044 to talk through your personal requirements. At D J Thomas & Son Funeral Directors, we understand how special life is with those that you love. For us, every funeral is unique and personal. We have a service to fulfil every wish, with every detail carried out with the same uncompromising quality of care. From a traditional service, to a colourful woodland burial, your options are limitless with our Full Service Funeral. If you have a little more flexibility when it comes to arrangements, then we can provide a Simple Funeral for a lower cost. You can park for free on Lower Wood Street. You can find our funeral home in Hanbury Square, and our chapel is 100 yards up the hill on Lower Wood Street. Our staff are available 24 hours a day on 01443 831044 if you require our services outside of these hours. Highly recommend these guys. made us feel very comfortable. opened the chapel of rest everyday whatever time I wanted for me to go and spend the last days with my Dad. Your service was personal and relevant. My father was treated with dignity.Your staff made what was a difficult journey easier. Thank you for the kind comments posted on your online review. I am glad we were able to provide you with the support and guidance needed and that we helped to make things easier for you at such a difficult time. All the staff, from start to finish were very helpful and compassionate, we can not thank them enough. I was very pleased with the service I received from DJ Thomas every thing went as I would have expected . The care, warmth and kindness shown by Nikki and the team at D J Thomas and Sons ensured my family were able to grieve for the loss of their family member in the knowledge that any requests with regards the funeral arrangements would be fulfilled smoothly and professionally. The staff showed great compassion and professionalism throughout the process of organising my mother’s funeral. Excellent service, everything went smoothly on the day of the funeral. Nothing was too much for them. D.J Thomas have organised my mother’s recent funeral and burial. They also managed my stepfather’s funeral two years ago. The service we received as a family has been prompt, efficient and compassionate throughout and we would have no hesitation in recommending them. Thank you for the kind comments posted on your online review. I am glad that we were able to provide you and your family with the care and support needed at this time. Samantha Nelson was excellent with the way she treated me & my family at such a sad time with the loss of my husband. She is very good at her job. Samantha makes you feel at ease & the kindness she showed us was unbelievable, this goes for all the staff at D.T.Thomas Bargoed. Nothing was too much trouble for any of them. Thank you for your kindness. I'd recommend you to anybody. Thank you for the comments left as part of your online review. I am pleased that you were so well looked after by our team and that we provided the highest level of care and guidance to you and your family. Thank you for your online review. We always appreciate receiving comments from our families, and we are constantly making improvements to enable us to provide the highest level of guidance and support. Great service from start to finish.friendly staff nothing to much trouble.would recommend.